BROWNSVILLE, TX, November 22, 2013, Surya P. Raguthu, MD, Director of Ace Pain Management and Medwin Family Medicine & Rehabilitation, has been recognized by Elite American Physicians for dedication, achievements and leadership in family medicine and pain management. Growing up in a family of renowned physicians and harboring a desire to help people, Dr. Raguthu started practicing medicine 26 years ago. For the past 15, he has been serving as the director of Ace Pain Management, a pain management center, and Medwin Family Medicine & Rehabilitation, a rehabilitation center that provides patients with family medicine and rehabilitation services. 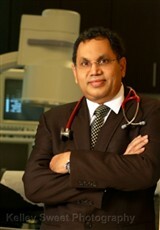 An interventional pain management specialist, Dr. Raguthu is responsible for consulting regarding management of acute pain, restoring optimal function to people with injuries to the muscles, bones, tissues and nervous system, visiting all departments in the facility, managing finances, attending staff meetings, and overseeing patient treatment. Dr. Raguthu also works with patients who need treatment for chronic and acute injury, musculoskeletal rehabilitation and cardiac rehabilitation. Dr. Raguthu is a highly skilled physician who is always looking to advance the field of medicine. Throughout his career, he has worked with industry pioneers and has developed programs specializing in administering physical, occupational and speech therapy in acute, subacute and outpatient facilities. A board certified physiatrist, Dr. Raguthu enjoys being able to allow his patients to live pain free lives through his treatments. He attributes his success to his discipline, hard work, dedication and ability to derive fulfillment from within his profession. Looking toward the future, Dr. Raguthu hopes to expand his practice to four or more locations in order to be able to help more patients who are in need of his services. 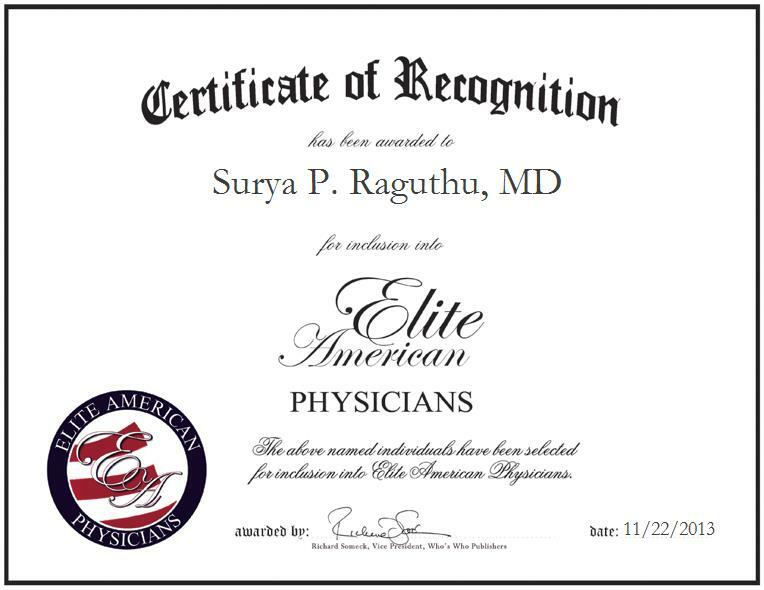 Surya P. Raguthu, MD was originally selected for inclusion in EliteAMERICAN Physicians in December 2013. We are proud to be featuring Dr. Raguthu again in EliteAMERICAN Physicians for 2014-2016. This entry was posted in Family Medicine, Pain Management and tagged musculoskeletal, pain management, Physiatrist, rehabilitation, treatment. Bookmark the permalink.